Samba Mix coming very soon. Never2Loud was formed after James Allan and Debora collaborated as members of 2Unlimited. James Allan and Debora met while they were both singing in a international gospel choir during a tour to Chicago, USA. Later after working many years as a duo, promoting the sound of 2Unlimited, they have found their own sound. It is a mixture of popular house, and Latin and is based around the usual rap and singing style that some compare to a mixture of "Faithless" and "Ludacris" from James and Debora's Brazilian roots add a warm Latin dance feel to the music. 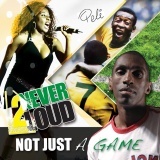 This the first Never2Loud project has managed to gain the support of the one and only Pelé, due to his relationship to Debora and the quality of the music. Now the band has simply moved on in a career that was inevitable from the moment the 2 showed the fun they have together when they take the stage, which is obvious and transported to their many and international fans.